The economic development of China is one of the most important events in the history of the world. In an unprecedentedly short time, millions of people have been taken out from poverty. But, as no country has ever developed so fast, that great story raises important worries. We invite you to read our today's article about the great progress China made in the last forty years and find out whether it's too good to be true and it must end with some catastrophe, triggering rally in the gold prices. One of the biggest risks for the global economy which can materialize this year is the slowdown of China's economic growth. So, it is wise to analyze the current state of the Chinese economy – its implications for the gold market and what will happen next. As December 2018 marked the forty years of market reforms in China, we will adopt a long-term perspective, explaining how China transformed itself from a poor, backward and isolated country to the world's economic power. We will examine what the global economy and the precious metals market can expect in China's fifth decade of reform and development. "Emancipate the mind, seeking truth from facts and unite as one to face the future" – these are the famous words Deng Xiaoping said in December 1978, triggering China's economic reform and opening to the international economy. Initially, the changes were rather modest, in line with the "bird-cage economy". The market was compared to a bird, which had to be contained, as otherwise it would fly away. The planned economy was still in force, but with market experiments. The reforms were implemented gradually, often started in only a few regions – the leaders expanded them upon proven success, in line with the country's motto "crossing the river by feeling the stones." 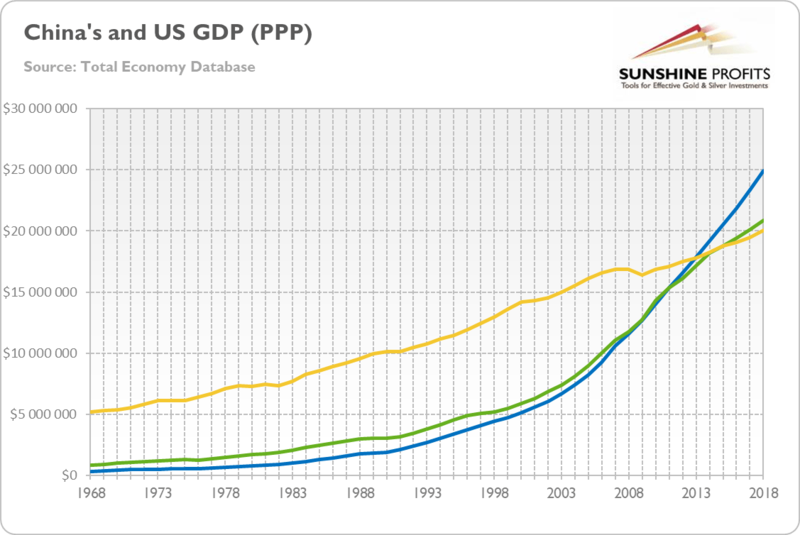 Chart 1: China's Official Real GDP (blue line), China's Alternative Real GDP (green line) and US Official Real GDP (yellow line) in millions of 2017 PPP US dollars from 1968 to 2018. The country also set three ambitious goals to realize the Chinese Dream. First, by mid-2021, for the centenary of the Communist Party of China, the existing economic model, based on investment expansion and export, is to be replaced by a sustainable development and strong internal consumption. Second, by 2035, China will become a global leader in innovation. And, third, by the end of 2049, for the centenary of the People's Republic of China, the country wants to achieve "great renaissance of the Chinese nation", through a reunification with Taiwan, creating the leading civilization on the globe. These are quite ambitious plans, aren't they? No wonder that the current global hegemon woke up. After all, the trade wars are not (only) about trade or tariffs, but (also) about dominance, hegemony and primacy in high technologies. China's economic rise over the last 40 years thanks to the systematic adoption of structural reforms has been extraordinary. However, as the country faces many challenges, the pace of economic growth has been declining in recent years, as one can see in the chart below. 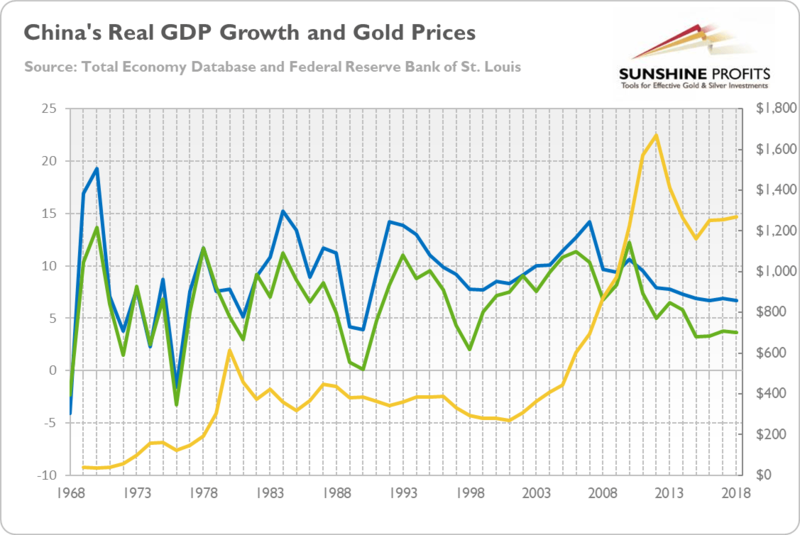 Chart 2: China's real GDP growth (official estimates – blue line, left axis, in %; alternative estimates – green line, left axis, in %) and the gold prices (yellow line, right axis, London P.M. Fix, annual average) from 1968 to 2018. One of the biggest challenges is the transition from the export-led to a domestic- consumption-driven growth model. Given that exports account for a decent part of GDP growth, the slowdown seems to be inevitable. But the question is: will China follow in Japan's footsteps, entering a multi-year stagnation? Possibly, but investors should remember that before Japan fell into stagnation, it had already reached high-income status in terms of GDP per capita, while China remains significantly below the threshold. And the country is not likely to fall into stagnation either. The slowdown is projected to be gradual (and, after all, the economic growth at 4-6 percent is still relatively fast). This is because China's governance system – characterized by centralized policymaking and decentralized experimentation and implementation – is relatively flexible and, according to some analysts, better-suited to rapid decision-making than dysfunctional and polarized politics under democracies. Having said that, it's clear that China will not be exempt from the iron law of regression to the mean in the long run. We are not naïve – and we do predict a slowdown in the economic growth. Actually, this is already happening. The World Bank forecast the GDP growth in China for 6.2 percent in 2019, a decline from 6.5 percent in 2018.You see, the country is going through painful structural reforms, just when the US decided to tighten its trade policy, while President Xi Jinping boosts his authoritarian rule, and the debt burden is mounting (Chinese households' debt to GDP ratio has soared from around 18 percent in 2008 to over 50 percent in 2018). All these factors increase the risk of crisis. The boom fueled partially by debt will have to finally come to an end. When it happens, it will affect the whole globe, including the gold market.